Kartell Dune Serving Tray by Mario Bellini for Kartell. Kartell's Dune Tray is one of the most beautiful serving trays ever created. The Dune tray was designed by Mario Bellini for Kartell in Italy. Kartell's innovative design transforms even a simple serving tray into something extraordinary. What good is a tray if it doesn't say something to the viewer, to the person examining it, using it? Who is going to remember it? What good is a tray if it's only good for carrying things? The Kartell Dune serving tray is a stylish kitchen accessory made by Kartell in Italy. 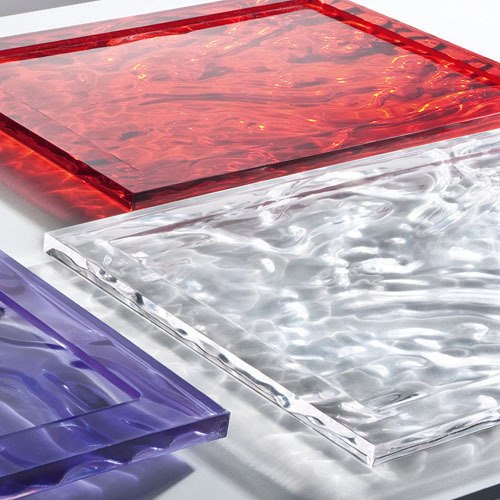 The semi transparent polycarbonate of the Kartell Dune serving tray sculpted from within varies in chromatic intensity and luminosity. 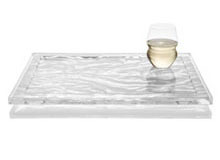 The Kartell Dune tray seems to project a magical three-dimensional illusion onto the surface holding glasses and cups. Images fluctuate and flow in the beautiful Dune tray. Like mountain torrents, rivers of lava, fiery flames. Animated images of the caprices of wind and light. Like the waves on the sea, desert dunes or the shimmering reflections of silk. These rainbow-colored trays are the first born of a family of small objects. Invented and designed to delight you with unexpected emotions.